Chart Wealth... Get Into The Right Stock At The Right Time! October 2005, Volume 2 Issue 10 Know It - Profit! In the April issue of Chart Wealth, I said gas prices would be cooling off going into the fall. Well, it looks like we're not having fall this year! Gas... and, more specifically, oil, will do everything but go down in the foreseeable future. The next US consumer crisis will be this winter when natural gas and heating oil demand will outpace an already dwindling supply... driving energy prices even higher. You can still take advantage of this unprecedented rise in the energy markets by tapping into the companies responsible for finding and exploiting those energy sources. This month, I've given you a year-to-date view of the markets instead of the usual quarterly snap-shot. Basically, the markets have been spinning their wheels. Only the Russell 2000 has managed to scratch-out a nine percent gain. In the May issue, I talked about exchange traded funds (ETFs) and how they enable you to trade the major indices and sectors -- helping diversify your portfolio. You may want to take another look at ETFs... beginning with the iShares Russell 2000 (IWM). 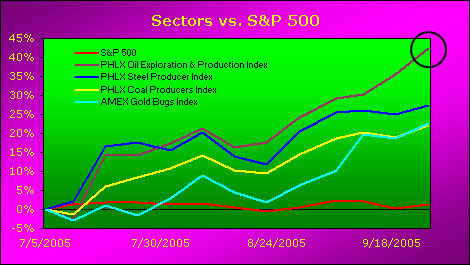 Oil-related sectors continue to dominate the market. 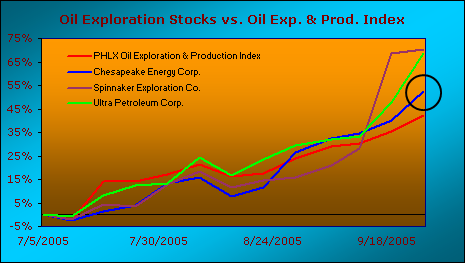 The PHLX Oil Exploration & Production Index (^EPX) has drilled ahead with an impressive 42 percent gain over the quarter. The recent rise in the PHLX Coal Producers Index (^SCP) makes sense as the market looks for cheaper fuel sources. Gains in the AMEX Gold Bugs Index (^HUI) points to more market uncertainty as investors hedge against a lackluster US economy. Leading the way is Spinnaker Exploration Co. (SKE)... up over 70 percent after announcing it was being bought by Norwegian-based Norsk Hydro ASA (NHY). 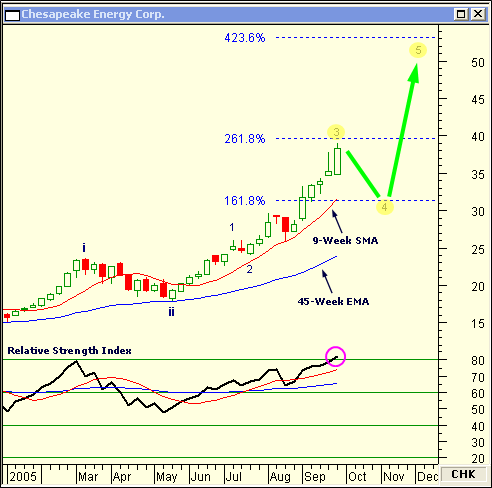 Ultra Petroleum Corp. (UPL) and Chesapeake Energy Corp. (CHK) are both up sharply... making phenomenal gains of 69 percent and 52 percent, respectively. The weekly chart of CHK shows the stock is in a strong uptrend... well above its 9 and 45 week moving averages. Also, CHK is completing a smaller third Elliott wave in a larger intermediate third wave. Additionally, the relative strength index (RSI) is extended over 80, possibly coinciding with the end of the smaller third wave. The Fibonacci extensions based on the smaller first wave reveal a final smaller fifth wave price target in the $50 range. Once CHK pulls back to the $30 area, a trade can be entered -- placing a protective stop under the low of the fourth wave. In the August 2005 issue of Chart Wealth, Veeco Instruments Inc (VECO) (View Chart) was getting ready to complete a third wave. On 8/3/2005, VECO put in a short-term top... completing the third wave. Then, VECO appeared to make a classic A-B-C wave correction down to $17.76 on 8/30/2005. This would have been a logical place for you to enter a trade... placing a protective stop just below the low. However, VECO stalled on 9/9/2005 and continued to trade lower. On 8/10/2005, the relative strength index flashed a warning when the 9-period SMA crossed below the 45-period EMA... even before VECO had a chance to retrace 50 percent of the previous move. 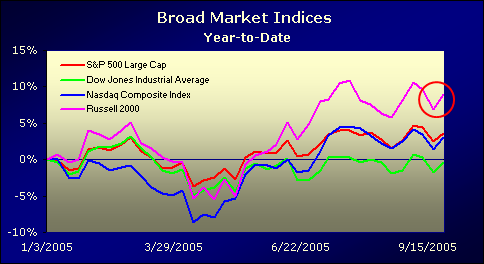 The wide-ranging day on 9/15/2005 was your final clue this trade had gone south and it was time to cut your losses. On 9/22/2005, VECO traded below the origin of wave two, canceling any chance of completing the five-wave pattern. In fact, now VECO looks like it is completing the third wave of a five-wave correction down! As we benefit from the fundamental gains in the various oil sectors, we need to remind ourselves of the forces which have driven those markets to their current highs. Consider donating a portion of your profits to a cause of your choosing so others less fortunate may benefit, as well.